Neat as it maybe, I wonder how usable this type of wallpaper actually is. When the wallpaper is turned ‘off’, it looks just like a regular wall. Maybe the designer could add visual detail to it as well, when it is in off mode. Either way, it looks like a fun thing to have on your walls. Fresh and innovative ways to recreate an old standard into something new and exciting is not unknown to us here at Electronic Décor, and this design idea for a remote is definitely just that. The Apple Remotes (not sure how Apple will feel about the name) which come in a pack of four, can be programmed for your own personal TV viewing preferences. They respond to motion kind of like a Wiimote, but with a simpler idea in mind. When you move the apple to the left it lowers the volume and if you move it to the right it raises it. The “bowl” that the apples sit in is their charging station, so you don’t have to constantly replace the batteries. And the charging station is quite stylish which will match most any décor. All the apples are purposely a different shade from one another so you know which one is yours. Hopefully there is a way to have one remote override another remote, or it will be all out battle trying to watch TV with two or more people controlling what you watch. At the moment the Apple Remote is just a design concept of Jason Roebuck’s but we hope that with the help of Sony the design will make it into production. Via Yanko Design. The High Fidelity Canopy or Hi-Can brings a new way to enjoy your media without leaving bed. With a built in projector, speakers, lighting, dvd player, and what looks like it could be a HTPC, you will be able to watch movies, listen to music, browse the internet, play video games, and even control your room. A sleek control panel in the headboard is where the ability to do all these things without getting up come in to play. The screen for viewing is retractable, as well as the two screens on the side for total privacy. At the end of the bed, the foot board opens to reveal the dvd player/ htpc which are inset into the board and no cables are present; just clean, modern design with tons of function. The details about the Hi-Can are few and far between right now. The designer, Edoardo Carlino of Deta Design is the creator of this new concept, but neither one has a release date yet. You can get a peek of the Hi-Can in action here. This tiled wall grid is a great way to add modern interchangeable design to your living space, along with lighting and color. The Wovin Wall System consists of a lightweight mounting grid which can be fixed to any wall or ceiling surface. The tiles, which are available in various finishes, are clipped into the grid in alternating directions to create the woven pattern. Finishes include wood, laminate, metal, polypropylene (which is basically a thick opaque plastic), and even custom images if you want to get fancy. The tiles can be easily replaced or updated with a new color, finish, or tile shape to suit changes in seasons or style. Place a light behind the tiles and you have an instant lighting fixture/ art piece that is modern and clean in design. The genius thing about the grid and panels is that you can hide any imperfections on your walls, so no “painting prep” needed. If you are not interested in wall decorating, try looking up. The grid can be fixed directly to ceilings without preparation in the same way as walls and translucent grid can be put in place of previous lighting fixtures to allow light through. The grid can also be suspended to create a false ceiling. Well how do you top a microwave with a LCD television mounted in the front door? with a refrigerator that has a LCD television mounted in the door of course. That’s right LG has integrated a 15″ LCD TV with FM Radio, Remote Control and 1024 x 768 resolution into the side door of their new LSC27990 side-by-side refrigerator. Not only that but the model also incorporates NBC’s Weather Plus service into the set-up. Weather Plus is a 24-hour weather network that allows you to receive up to the minute weather updates, and you thought the fridge was just for keeping things cold. The Linn KOMPONENT system speakers are built using a unique aluminum extrusion which gives the speakers a clean modern look, but looks are only a portion of the appeal here. Having owned a pair of Linn speakers for over 10 years now, I can tell you they are without a doubt some of the most musical speakers I’ve ever heard. What’s that you say, don’t all speakers play music? While it’s true that any working speaker is capable of sound playback I’d argue that they don’t all play music, or rather convey the depth of emotion music is capable of brining out in listeners. If you’re in the market for stereo or surround components I wholeheartedly recommend visiting a Linn dealer, not only will you see some great equipment you’re very likely to hear some great music. Here’s an attractive little surround sound speaker system from Tannoy aptly named the Arena, which consists of stereo fronts, a pair of rears, center channel and active subwoofer. The satellites can be wall-mounted or mounted on the optional matching stands. The system comprises four satellite loudspeakers, a dedicated centre channel loudspeaker and an active subwoofer. Accessories such as grilles, spikes, spike protection boots for use on polished surfaces, and 20 metres of speaker cable are provided, and stand options are available. 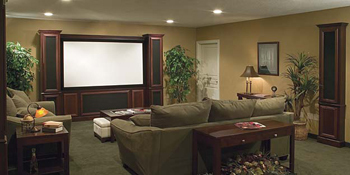 Custom home theater construction is often a lengthy and costly endeavor, but RBH has developed a modular on-site installation system that is said to cut installation time and the associated costs substantially. RBH’s CinemaSITE system consists of custom cabinetry and RBH’s surround sound speakers designed to be paired with an overhead video projector. This preconfigured approach may not be for everyone, specifically to those applications where cabinetry isn’t required. But for those who want the custom home theater look without the muss n’ fuss associated with it, RBH’s CinemaSITE system may very well be worth a look.